Calling all chocolate lovers to Cranachan and Crowdie! The fantastic range of treats from the Wicked Chocolate Company have just arrived and are the perfect winter treat. But make sure you stock up; they’re addictive! The Wicked Chocolate Company was founded by Elaine Forrest in Perth, and never compromises on quality or service. Simplicity is the key for her, with a focus on the finest raw ingredients that make simply the best chocolate, without the fuss. Come down to Cranachan and Crowdie to see for yourself what all the fuss is about, and take your pick from the huge selection of goodies from chocolate buttons, Neapolitans and drinking chocolate to luxurious Irish cremes, mint crisps and lavish raspberry champagne truffles. With the distinctive black and red boxes and pretty chocolate-filled pouches they make ideal gifts for Easter. If these little treats aren’t quite enough for your sweet tooth this Easter then look our for Cranachan and Crowdie’s limited handmade Easter eggs, filled with decadent truffles for extra indulgence. Hurry though, and make sure you grab one before they’re all gone! Don’t forget to visit the Wicked Chocolate Company’s website for more ways to enjoy wicked chocolate. More of a savoury tooth than a sweet one? Luckily for you, Edinburgh Foody are bringing the Savoury Not Sweet group to Cranachan and Crowdie! They’re beginning their mission on 25th September to bring the best savoury tastes in Edinburgh to those who prefer a great cheese or meat to sugary snacks. As your host, Cranachan and Crowdie will be providing the food, so this is your chance to grab a cheeky wee sample of some of their best high quality products including venison from Great Glen Game, cheese from I.J. Mellis Cheesemongers, mini bread loaves from The Manna House Bakery & Patisserie, chutney from Trotter’s Independent Condiments and a range of oatcakes. They’ll also have a surprise selection of beer donated by Innis and Gunn on hand to wash everything down. 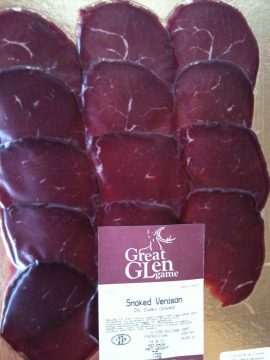 Anja Baak from Great Glen Game will also be joining in the event, and will chat about her fantastic products. What more savoury treats could you ask for? Lisa’s Top Tip: Tickets are limited, so follow this link to secure yours, and sign up to the Savoury Not Sweet mailing list while you’re at it!